Bad medicines don't just threaten lives; they undermine the entire medical system. 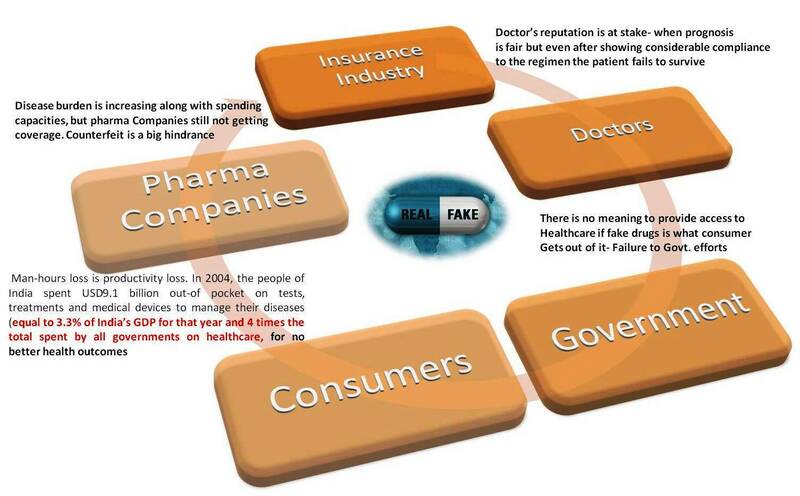 There are distinct aspects to deciphering and de-complexifying the counterfeit pharmaceutical supply chain. 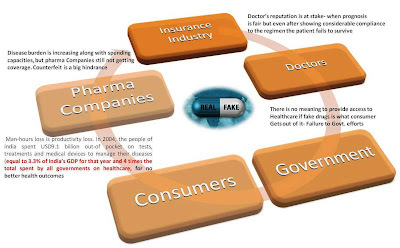 One that is probably more in use today by almost all pharmaceutical companies worldwide is the product-based tracking methodology which incorporates the use of high technology systems to identify counterfeit products in the market. 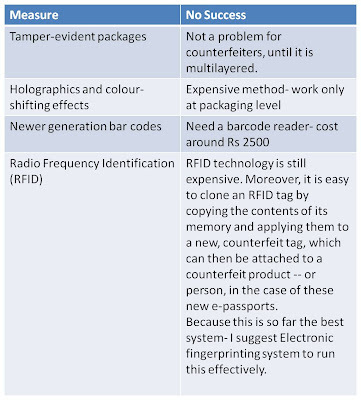 These technologies include tamper-evident packaging, holographics, bar codes and the more recent RFID. People buy two tablets and never a strip. The unique number idea doesn’t work here. 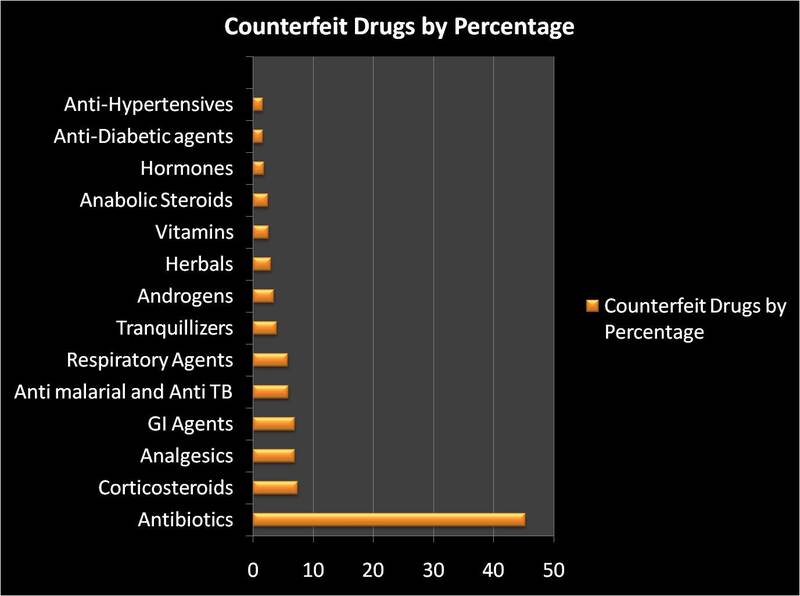 Chemists know that they are buying counterfeit drugs- they get better margins on them. 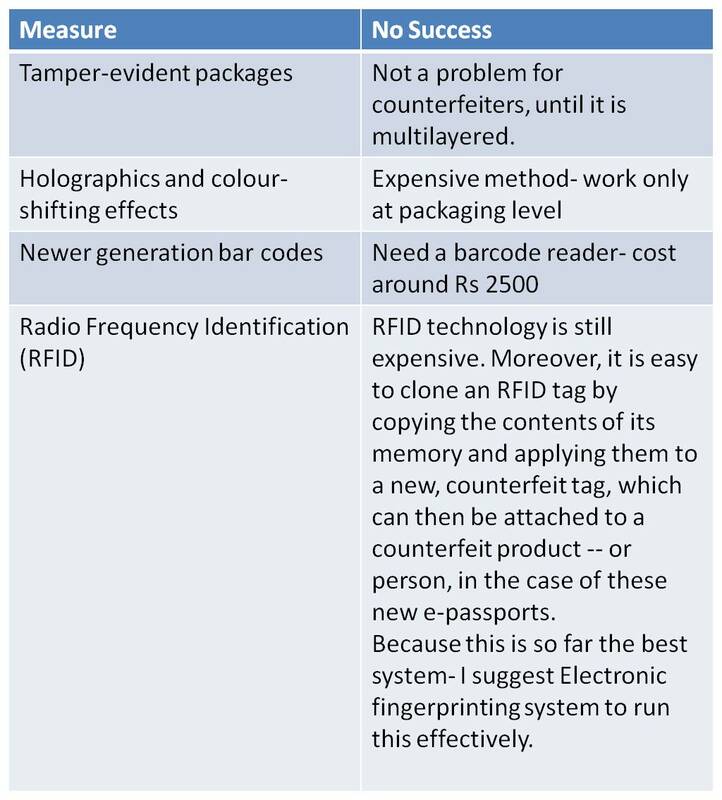 Chemists don’t want to find out whether they are selling counterfeit drugs?- Barcode thing doesn’t work here. Same stuff with hologram and all. Interventions are required at the distributor level or best at the consumer level. Roger Bate says “According to an investigation I just conducted with the Legatum Institute and the International Policy Network, the situation is as bad with at least some of Delhi's wholesalers. 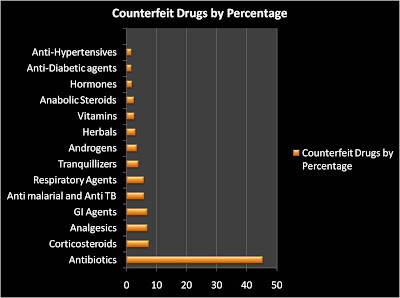 We found that 7% of all tested samples were substandard and 3.6% were likely counterfeit. 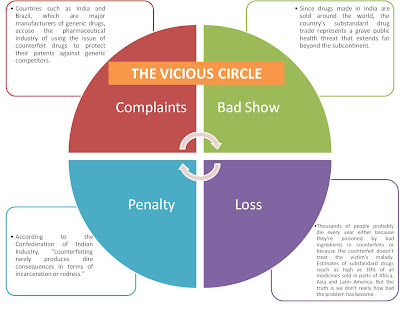 It's probable that the drug supply in poorer areas is even more contaminated. 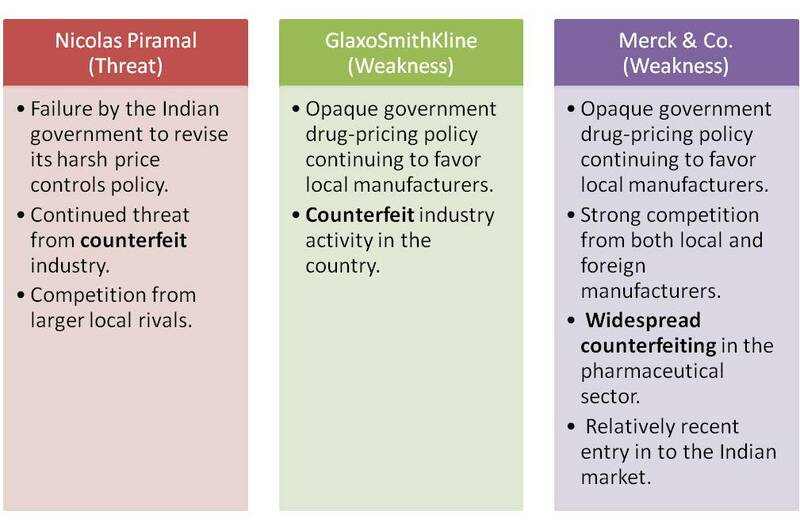 A strong majority of Indian pharmacists interviewed in our investigation admit that fellow pharmacists knowingly profit from the sale of counterfeit drugs. Nearly all of the pharmacists interviewed claimed to have been propositioned by counterfeiters at one time or another. Last year alone, counterfeit drugs were seized by authorities in Bangalore, Mumbai, Delhi, Jaipur and many other Indian cities. In 2008, about half of the medical products that were confiscated by European Union customs officials originated in India. Innovative Transponders-The Radiopharm Project -The most innovative is the tagging of transponders on item-level (incl. write and read processes), not only on case or pallet level. It was aimed to get an identification of every single transponder, despite the disturbing influences of liquids and metals. This requirement creates new challenges, especially for the RFID technology that occurs in the pharmaceutical area. The co-workers of the IFT built a test rig for multiple test scenarios as a demonstrator to proof the technical realization of the developed system. With this test rig, it can be determined if the transponders could be reliably accessed independent from the dosage form (like liquids, tablets, ointments), both for item identification and bulk identification. As a result, it is possible not only to illustrate a production line of a pharmaceutical manufacturer, but also the verification process after order picking at the wholesaler. By the use of these systems customers will have a higher security when buying drugs. 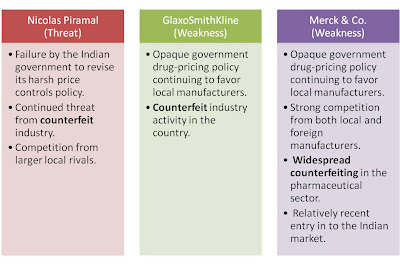 In the SWOT analysis of Big Pharma majors, Counterfeit was reflected as a common problem. I just finished working on a Counterfeit drug detection model. Cost per counterfeit drug test Rs 1 only. Interested Companies/researchers can reach me at drruchibhatt@gmail.com.